Nie Weiping On Go The Art of Positional Judgement is a Go book authored by the Chinese professional Nie Weiping and published by the Shanghai Cultural Publishing Company. 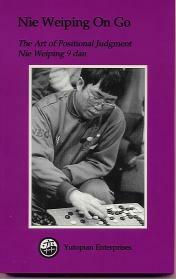 In 1995, Dr. Sydney Yuan translated the book into English and published with Yutopian Enterprises. 200 pages. ISBN: 0-9641847-2-9. IanDavis: I found this book to contain some very sharp and different ideas to my own on how to play the game. The writing style and the placement of diagrams/figures is probably my only criticism of this book. Otherwise it provides the reader with good advice on direction of play, using counting in deciding where to play, the timing of moves, and many other aspects. Something of a jump-start to your thinking.